That declaration mirrored Korolev’s own reasoning. “I really liked [it],” the heavily recruited Missouri all-state runner says now. “And Harvard cross-country and track were real underdogs. Cross-country had been getting very poor results. 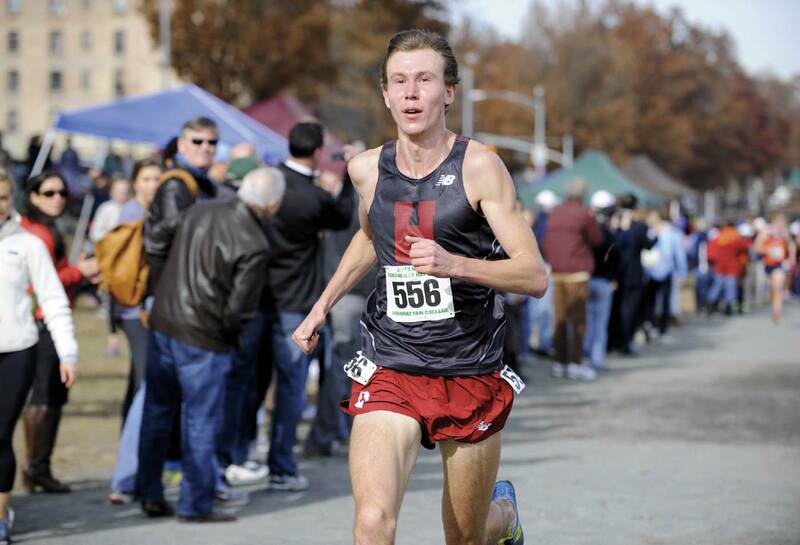 But they were starting to come around.” For example, Dan Chenoweth ’11 (see “Hotfoot,” November-December 2010, page 69) had just captured Harvard’s first Ivy League cross-country championship in 15 years. “I was excited to be part of that,” Korolev explains. “Maks,” as his teammates call him, has not only been part of that turnaround but has made some history of his own. Last fall, the Crimson qualified to compete at the NCAA cross-country championships for the first time in 35 years. Korolev finished third overall with a time of 29:59.5 over the 10-kilometer course, the highest such finish in Harvard history. He’d earlier posted an Ivy record time at the fall Heptagonals while winning the conference title on an 8K course. Indoors, at the Terrier Invitational in Boston in January, Korolev ran the 5K in 13:42.56, shattering the Crimson record of 13:59.35 by nearly 17 seconds. His time was a new Ivy record, more than three seconds below the standard set by Olympian Donn Cabral of Princeton. Then in February, at the Boston University Valentine’s Invitational, Korolev won the 3K run by 0.5 seconds in a time of 7:51.52. That lowered the Harvard record by six seconds, and also set a new Ivy mark. At the indoor NCAA Championships at Albuquerque in March, he placed thirteenth in the nation in the 5K, and fourteenth in the 3K, becoming a Second Team All-American. Meanwhile, the team as a whole has been coming together and achieving the kind of success Korolev anticipated as a freshman. In March, at this year’s Heptagonal meet (which decides the Ivy indoor track championship), Harvard’s women finished first and the men’s team third, making the Crimson the league’s best combined track-and-field squad. In a photo finish there, Korolev came in second in the 5K, only 0.16 seconds behind his training partner James Leakos ’14, who won in 13:58.67. Distance runners aren’t known for towering height, and at six feet, five inches, Korolev is one of the taller ones. He might have good running genes. Born in Kazakhstan, he is half Russian and half Tatar. On a trip to the old country he took runs with his biological father (his parents divorced when he was two), and found that the older man, with no training at all, could run for an hour alongside him, if not at “Maks” pace. At 160 pounds or less, Korolev himself has minimal bulk to transport; less body weight also softens the physical impact of each footfall. He spoke only Russian until arriving in America, but forgot it all to learn English; Harvard courses have helped him recover much of his first language. Korolev concentrates in human developmental and regenerative biology; he’s been interested in the aging process since high school. He took computer science at Harvard, and likes technology and “tech stuff”; next year he will enroll in an M.S. program at Stanford in management science and engineering (a “techie M.B.A.,” he calls it). “I respect Apple,” he notes, “but I like Android a bit more.” Even more than that, he likes making history.